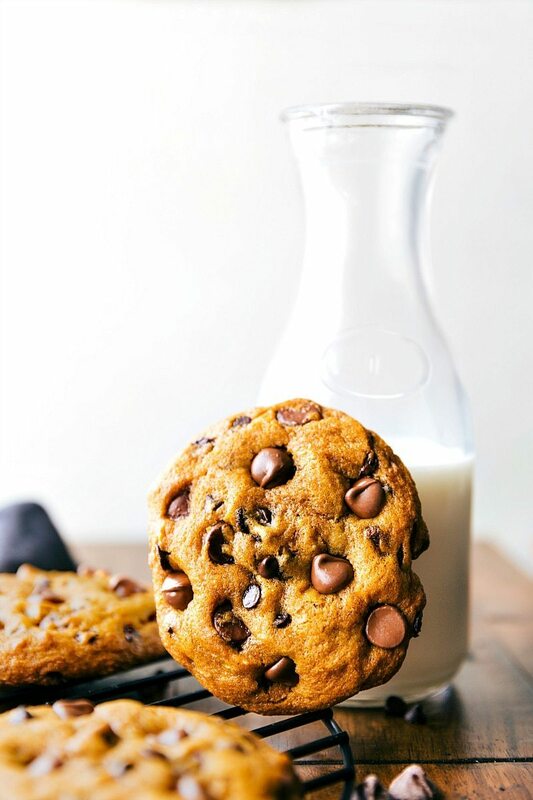 Super big, chewy and soft, muffin-top like pumpkin chocolate-chip cookies that taste like they are straight from a bakery! These bakery-style pumpkin cookies are made in ONE bowl! Several months ago, being the very mature daughter that I am, I told my dad that “someone” said he looked like an owl. (Their natural response is supposed to be “Who? !” and you laugh to yourself as that person is making an owl sound.) Except it didn’t quite work like that. At first he just kind of ignored me and chuckled quietly about it. And a minute later,”As long as I’m comfortable with myself I don’t really care what other people think” (<–always a teaching moment). By this time the rest of the family was involved and trying their hardest to not bust into laughter. We all tried our best to coax him into asking “Who?” and it just never happened. I suppose that is what I get for trying a grade-school joke out on my very literal father. He just had a birthday this past week and it was great to celebrate him. My boys are especially crazy about their “Papa” as he’s all jokes, wrestling, tickling, and way too much fun. The toddler blew out his Papa’s candles on his birthday cake because he’s the kind of guy that gets more excited about others being happy than he is ever worried about his own happiness. And, we were all very grateful that my mom used two number candles instead of using up 3 boxes of candles and having us all wait while my toddler blew air/spit (mostly spit) all over the cake. With only 2 candles, the spit is definitely minimized. I wish I could nicely transition talking about my dad and his birthday into this recipe and these cookies by telling you that they are his favorite or that we made them together growing up, but neither is true. And while he does love pumpkin cookies, he’d pick oatmeal cookies over pumpkin any day. And baking? Never with my dad. He was more of the dutch oven, camp-fire cooking kind of guy. So, with that said, here’s my non-existent transition into telling you about these cookies. Last year, I shared “non-cakey” pumpkin cookies. If you are craving a solid cookie texture with the flavors of pumpkin pie spice, THIS is your recipe. These cookies however, are quite cakey. They are thick, chewy, soft, and resemble a muffin top. These are similar to the pumpkin cookies my mom made growing up and while some would argue they aren’t technically cookies, they are one of my favorite Fall treats. And now my family’s as well. In a large bowl, add in ONE CUP of canned pumpkin (not pumpkin pie filling and not an entire can of pumpkin), white sugar, brown sugar, vegetable oil, the egg, and vanilla. Beat until completely smooth. If desired add in the food dye. This gives the darker more "pumpkin looking" cookie. These photos are of dyed cookies. Without stirring in between these additions, add in the cinnamon, pumpkin pie spice, baking powder, baking soda, salt, flour, and both types of chocolate chips (1 cup of the milk chips). Now with everything layered on top, beat together all of the ingredients until *just* combined. Cover tightly and chill the dough for at least one hour up to 10 hours. Chilling is not necessary but it gives you the bigger pumpkin bakery-style cookies. When ready to bake, preheat the oven to 350 degrees F and line a large tray with parchment paper or a silpat liner. Place 6 mounds of the dough on the cookie sheet. Scoop the dough to make a higher ball dough rather than a wide ball of dough. Use about 3 tablespoons to 1/4 cup dough to get the large bakery style cookies. Don't do more than 6 cookies or they will run together. Bake for 12-15 minutes (slightly under-bake for best results of getting a soft and chewy cookie) and remove. 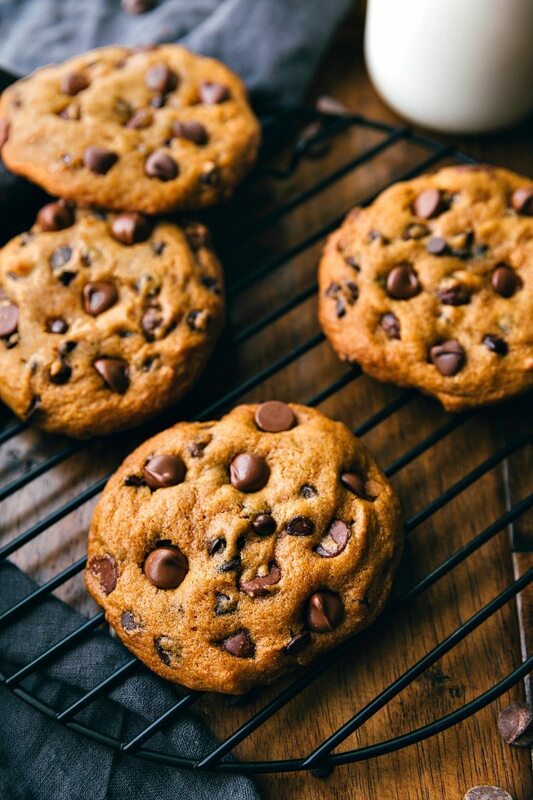 Use the remaining 1/3 cup of chocolate chips to place on the cookies right out of the oven if desired. For a fudgy pumpkin pie type cookie, chill the cooked cookies in the fridge -- delish! These cookies have a more developed pumpkin flavor by the second day or after chilling. *We like a mild amount of spice in these pumpkin cookies. If you like lots, use another teaspoon of pumpkin pie spice or an additional 1/4 teaspoon nutmeg and 1/8 teaspoon ground cloves. Previous Post: « Thanksgiving Dinner: How Much Should Food Should I Make? 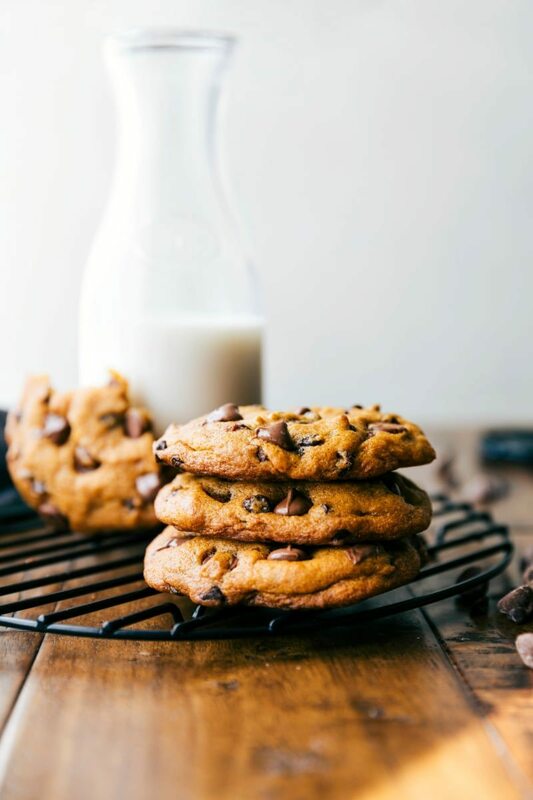 These look fantastic and I can’t wait to make them (bakery style cookies are the best)! Have you ever made cookies using a whoopie pie pan? They fit just about 1/4 cup dough and yield massive cookies that puff up like muffin tops – plus, they’re all uniform in size. I think I’ll try baking these cookies both on a cookie sheet and whoopie pie pan and see how they turn out 🙂 Thanks for sharing! Thank you so much Natalie! 🙂 I haven’t tried these in a whoopie pie pan, but I’d love to hear your results 🙂 Enjoy! hoooolyyyy cow!! YUM!! WOULD LOVE TO MAKE THESE. Just made this and the dough looks like cake batter! Followed the instructions step by step I don’t know what to do with that, should I add more flour? Hi Heather! Are you at a high altitude? If the batter is super wet, I would add some more flour. It won’t be very firm like a regular cookie dough though. Did you already chill it? Mine was also runny like cake batter ): Hoping the chilling will help it out. It’s not supposed to be a thick cookie dough 🙂 It should be runnier than most doughs! Great recipe! I just tried these out. I love soft, chewey cookies and these were great! 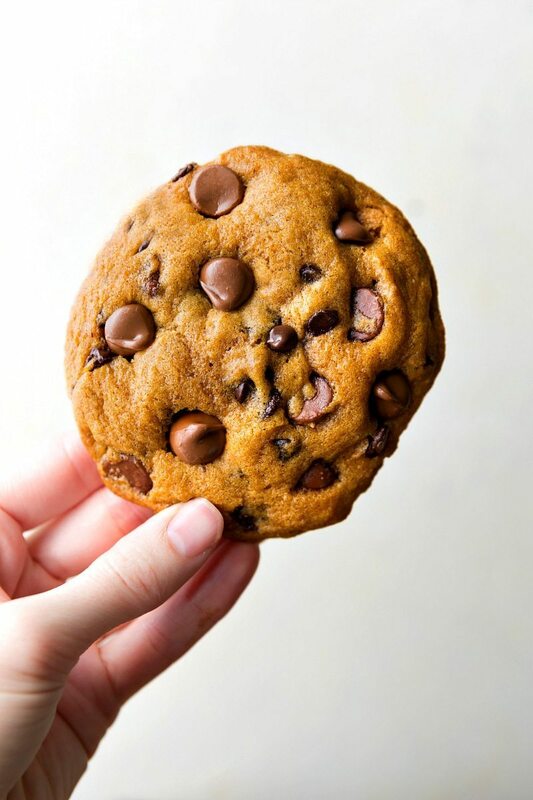 I have several pumpkin chocolate chip cookie recipes I always use but I saw this one and had to try it!!! Love, love, love!! This is my new go to recipe. They were delicious and turned out perfectly. My picky kids loved them too! Thank you for this recipe. I will be making these several more times this season!! Oh YAY! I’m so thrilled to hear this is your new go to and that they turned out perfectly for you 🙂 Thanks so much for the comment Melissa! I followed the recipe exactly, then put the batter in the fridge for 3 hours while I went to run errands. The batter came out perfect! My husband & I loved these cookies ?! So wonderful to hear!! I’m so glad these cookies were enjoyed by you both 🙂 Thank you! Can I substitute something for the vegetable oil? Thanks! I haven’t tested other alternatives, but you could likely use another oil and get the same results. Enjoy! 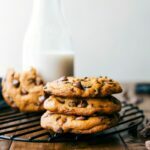 I want to try your recipe but would prefer to make regular size cookies. Have you ever tried this & if so how long would you bake them? My dough came our “sticky” and almost the same consistency as cookie dough, not runny at all. They did not come out flat like yours, but I used an ice cream scoop. Tried flattening them a bit and…….still cake like but bigger. Sticking with the smaller ice cream scoop. Don’t taste much pumpkin though. Still a hit here. Question…what did you do with the extra pumpkin? I hate for it to go to waste. It sounds like you probably packed in your flour and added a bit too much! If you press a measuring cup into flour you’ll pack in a lot more than spooning and measuring it in. That’s just if you want them flatter like my pictures 🙂 I’m glad they were a hit though! You can also up the spices on these if you want a stronger pumpkin flavor. And yes, I hate wasting pumpkin too! I’ll use it in another recipes (usually throw it into a pumpkin breakfast drink (recipe: https://www.chelseasmessyapron.com/pumpkin-pie-protein-shake/). It also can be frozen to use at another time. While I didn’t pack the flour I did level it off, so I can see how that might happen. I will try again with just spooning it in. Does it work by using a weight measurement as well? I have a kitchen scale I can access. I tried this recipe last night, as I don’t like hard cookies and substituted the oil for applesauce. These cookies are amazing, they keep soft and chewy, my whole family loves them. These cookies were so yummy! I ended up putting them in the oven for 11 minutes and they turned out delicious. Would this dough freeze well? I’m sorry Marta, I’ve never tried freezing this dough so I can’t say for sure. I don’t see why it wouldn’t though. Great recipe I will definitely add more cinnamon and nutmeg next time too! Ok I just found this recipe today, so I hope you can still respond since it’s been a long time since you posted it. I made the dough and it’s kind of runny. Not dough like most cookie dough. Is this normal? I added all of the ingredients just like it said to do. Looks so good. I can’t wait to bake them. In the recipes do we use sweetened or unsweetened can pumpkin? I made these wonderful cookies tonight with a few substitutions you may be interested in… for the oil I used coconut oil softened/melted in the microwave. I doubled the cinnamon to 2 teaspoons… and instead of food coloring, I added 1 teaspoon of turmeric! It enhanced to color and added a nice spice note to the blend. Hi there, can you make the batter the night before and refrigerate the dough overnight ? I made these the other day with my two little girls and we LOVE them. Even my husband, who doesn’t usually like sweets or pumpkin, ate a bunch of them. This is officially my go-to recipe for pumpkin chocolate chip cookies. Thanks! These were delicious! I especially liked the taste of milk and semi sweet chips in them, and even decided to add in some white chips, too! I loved them with the three kinds of chips (and every bite was full of them!) but white chip haters (like my daughter) will be happy with just the two other kinds. These were divine frosted with cinnamon cream cheese icing, which you can find on Chelsea’s Pumpkin Cupcakes recipe. Also, I wanted to make these really small to have along with several other desserts at a bridal shower. I needed them even smaller than my smallest cookie scoop would do, so ended up using a melon baller to scoop out the batter, then another spoon to get it out of the melon baller. It was a little tedious, as the dough is pretty sticky, but they were just the right size that way! I did wet my hands with cold water (you just want them damp so your hands don’t stick to the dough) to shape them a little rounder before I baked them, so they were more uniform in shape without jagged edges. They needed to bake for 8-9 minutes at that size. Has anyone tried to freeze these after they’re baked? Wondering if I can make these ahead of time and then bring them out day of. Thank you!